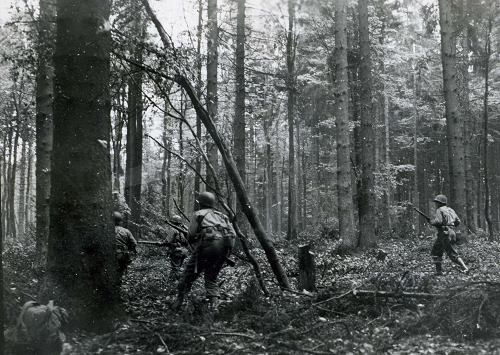 On November 2, 1944, in preparation for the First Army’s offensive, Company E of the 28th Infantry Division’s 110th Infantry Regiment moves through the Hürtgen Forest near Vossenack, Germany. 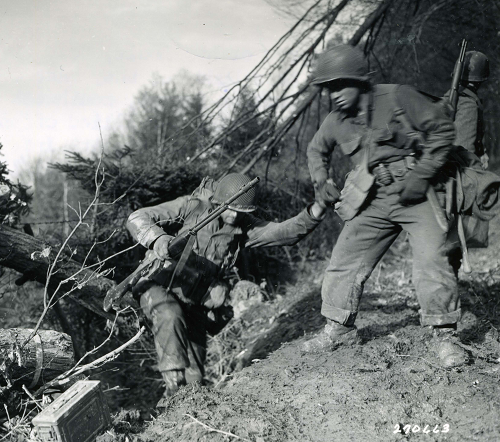 Private First Class Benny Barrow of Company I, in the 4th Infantry Division’s 8th Regiment, helps his buddy up a ragged Hürtgen Forest hill. 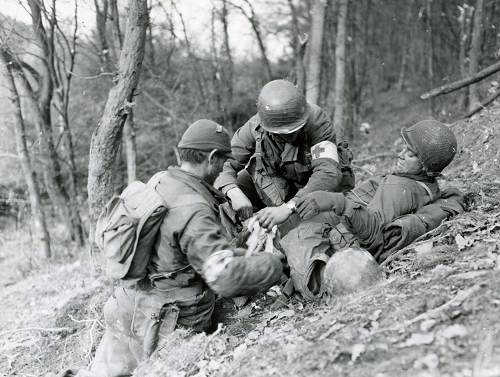 Two medics treat Benny Barrow for wounds sustained the very same day he helped his buddy up the hill. Barron was one of up to 35,000 American casualties—killed, wounded, or missing—in the Hürtgen Forest. 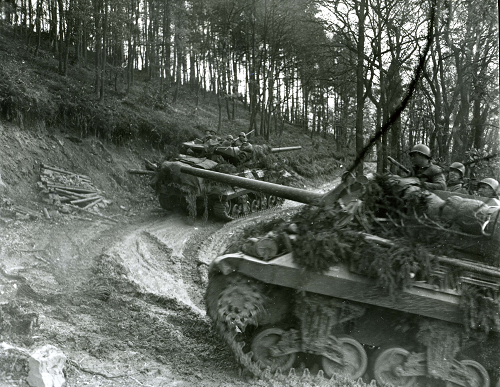 Troops ride 3rd Armored Division tank destroyers up a narrow, muddy road in the Hürtgen Forest. The overall goal of the US advance in the German woodland was to pierce the forest, cross the Roer River, and reach the Rhine. But tangled woods, impassable roads, and dug-in enemy firepower turned the assault into a bloodbath. 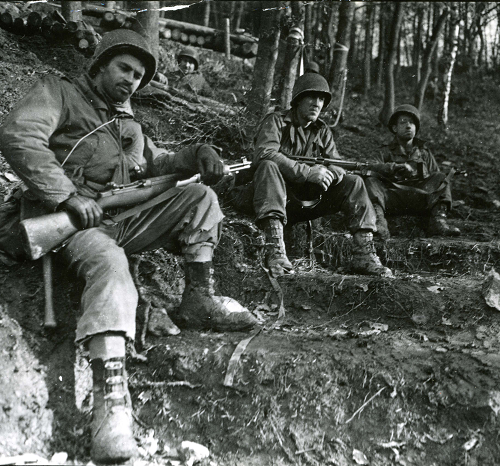 Private Maurice Berson, Sergeant Bernard Spurr, and Sergeant Harold Glessler (left to right)—three weary Infantrymen—take a brief rest on a slope in the Hürtgen Forest. 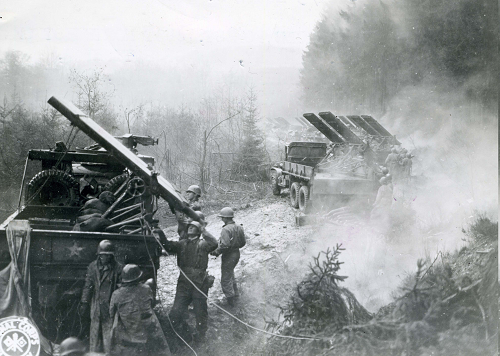 On November 26, men of Battery A, 18th Field Artillery Battalion, reload their rocket launchers north of the town of Hürtgen. 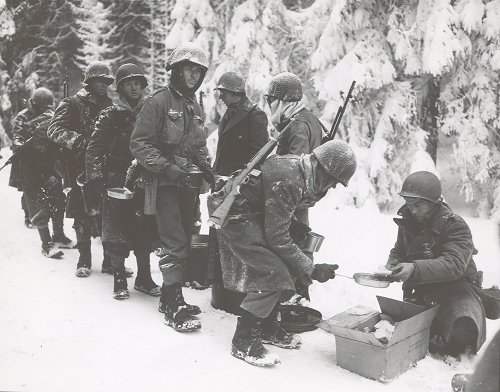 In the bitter cold of December, these fatigued 78th Division GIs patiently wait in a Hürtgen Forest chow line. 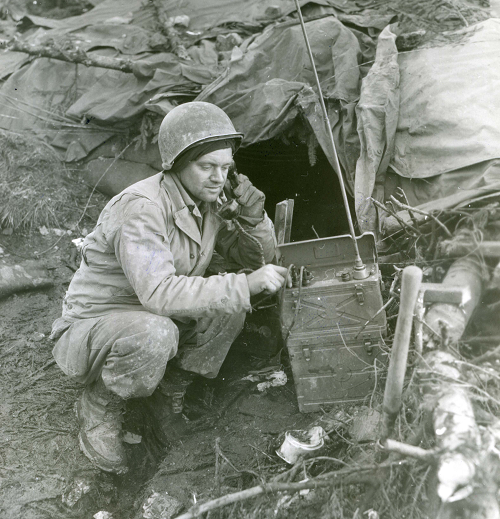 Private First Class Harry Bremer of the 86th Chemical Mortar Battalion’s Company A gets coordinates for his unit’s next mortar attack on December 6. 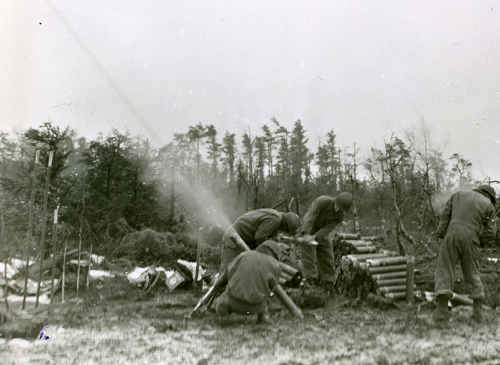 A US mortar crew lobs a round in December. Only direct hits could disturb the Germans’ log-and-earth fieldworks. 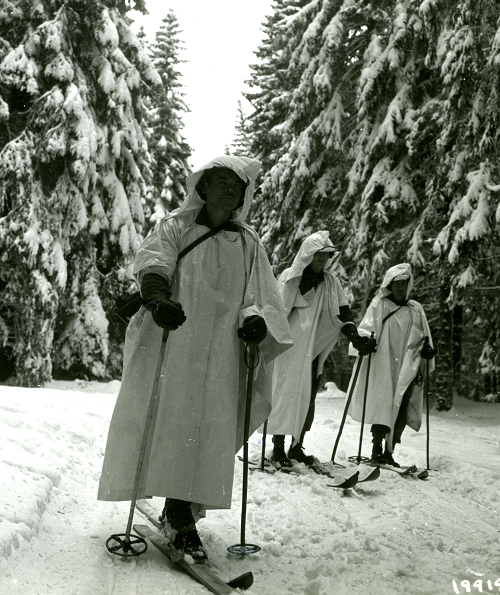 In January 1945, at the end of the Battle of the Bulge, three men of an intelligence and reconnaissance platoon use skis on patrol in the snow-covered Hürtgen Forest. Their mission is to explore an underground tunnel that the Germans used, it seemed, to get behind the American lines. By February, the Americans had gained control of the Hürtgen Forest. 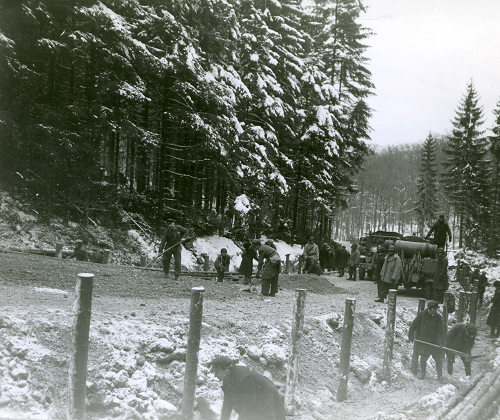 Here, US Army engineers supervise German civilians, ranging in age from 14 to 60, who were pressed into service to repair roads. The Hürtgen Forest was secured in early 1945, but that didn’t make it an easy place to navigate. 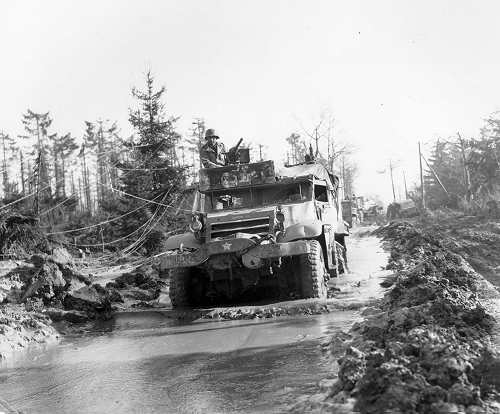 This half-track of the 16th Infantry Regiment, 1st Infantry Division, braves a flooded road in the battle-ravaged forest.